Sample of Boy Memory Box. More photos below. Evan's Embrace donates Memory Boxes primarily to Seattle area hospitals, which are given to parents whose babies are stillborn, or die during or shortly after birth. 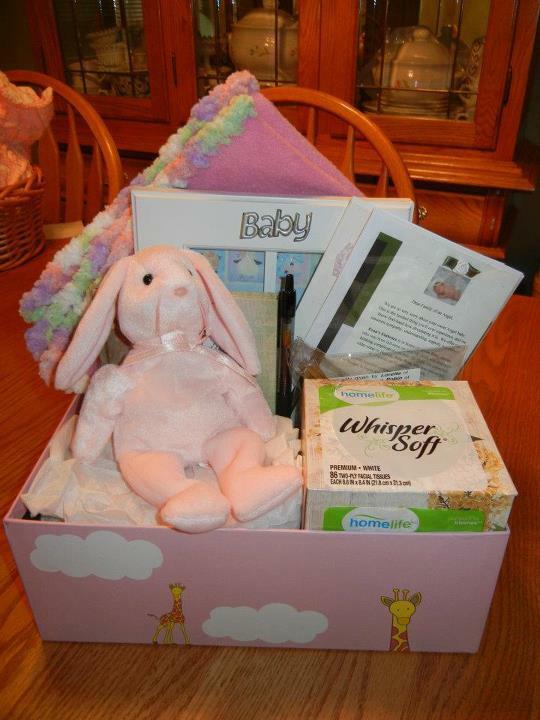 Included in each box is a handmade blanket, photo frame, stuffed animal, Angel Christmas ornament, decorated votive candle, and many other items that can help bring comfort to the family. Also included is a list of helpful resources relating to babyloss, and the booklet "When Hello Means Goodbye". Starting with a donation of 3 Memory Boxes in 2011, we've provided hundreds throughout the years. If you would like to sponsor a Memory Box for someone in the Seattle area, or have one shipped elsewhere in the U.S., please consider a $20 donation via our website, and let us know where it should be sent.